Wall impact frequently occurs on external corners within a building. Suitable corner protection helps to prevent damage to the most vulnerable part of internal walls. CS corner guards are available in a range of heights and performance levels, with models to suit 90° and 135° corners. Irregular angles can be accommodated, with rubber and stainless steel options also available. The range includes models to suit all budgets & design requirements. 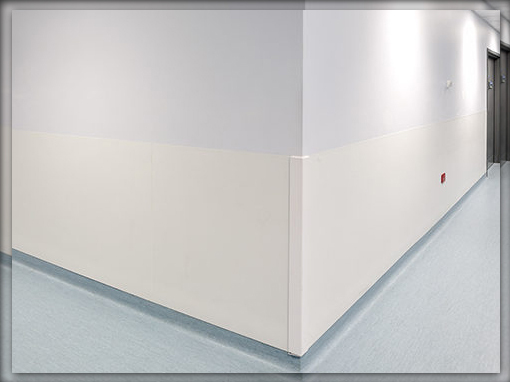 Protect corners from damage & reduce maintenance costs! A collection of easy to install corner guards, from mechanically fixed solutions to stick on options. The original “shock absorbing” standard corner guard prevents unsightly damaged corners. The SM-20N (6.4mm radius) and SM-10N (25.5mm radius) are 77mm corner guards with snap on covers. Optional horizontal reveals are available for SM-20N. This 77mm corner guard is used for 135° corner conditions, other angles available. The snap on cover is attached to a two piece retainer. Top and bottom end caps are included. The SSM-20N and SSM-10N are 6.4mm radius and bullnose corner guards with snap on covers. The SSM-25N (6.4mm) is supplied with (2) SSM-20Ns and a sheet backer cut to size. Optional horizontal reveals are available for SSM-20N & SSM-25N. These lower cost corner guards are made from Acrovyn and they don’t utilize a retainer. Available in several widths, these guards are available in all Acrovyn solid colours and adhere to the wall with self-adhesive tape. Durable, scratch resistant polycarbonate corner guards provide facilities with unobtrusive corner protection. Clear guards in six widths mount to corners using chrome-plated screws. Rugged stainless steel corner guards can be used in all types of buildings. Ours are 304 stainless alloy with satin finish. CO-8 has 89mm legs (custom sizes available). Specify SCO-8 for end wall conditions. 8 powder coat finishes available. Try the LG series if you are looking for a clear corner guard. Square nose wood/stainless corner guard. The SMWS-20 corner guard features a 45mm x 45mm recessed stainless steel insert in the 70mm x 70mm wood guard. Stainless steel caps are standard. Optional wood caps available. 8 powder coat finishes available for steel components. Our Wood and Stainless bullnose corner guard. The SMWS-10 corner guard features a 25.5mm x 25.5mm recessed stainless steel guard in the 70mm x 70mm wood guard. Stainless steel caps are standard. Optional wood caps available. 8 powder coat finishes available for steel components. ‘Built-in’ to sit flush with the wall surface! Flush mounted corner guards are generally installed in new construction environments to give a ‘built-in’ appearance, with protection being mounted flush to the wall. The FS-20N flush corner guard offer designers a 77mm sharp nose custom “built-in” appearance that is completely flush to the wall surface. The retainers attach directly to the drywall and are feathered in to achieve a flush appearance. The SFS-20N (6.4mm radius) corner guards feature 51mm legs that are perceptible when installed, but provides serious corner protection in new construction environments. The SFS-10N (32mm) corner guard features 51mm legs that are imperceptible when installed, but provides serious corner protection in new construction environments. The FS-10N bullnose corner guard offer designers a 77mm bullnose custom “built-in” appearance that is completely flush to the wall surface. The retainers attach directly to the drywall and are feathered in to achieve a flush appearance. height : 400pxThis custom flush mounted corner guard is designed for custom corner/wall conditions. The FSC-25N can be manufactured in virtually any width to meet the finished wall’s dimensions.